Take the opportunity to get the most out of your hobby! 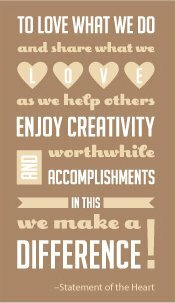 Whether you are looking to grow your stamping and crafting abilities and save money on everything you order; or love sharing your knowledge and experience with those around you and would like to earn extra money doing just that, I’d love to help you make the most out of it as a member of my Fun n’ Crafty group! We are a group that includes both hobby stampers and career demonstrators from across the U.S. and invite YOU to join us. With the $99 completely customizable Starter Kit, it is easy to get started. Plus, there’s no obligation to sell or hold workshops and no penalty if you decide to drop! With up to 5 months to enjoy the benefits of being a demonstrator, you have time to decide what you think. If you love it, all it takes is a $300 sales minimum (which includes any of your personal orders before your discount) to remain active and continue getting all the benefits. Receive Stampin’ Up!’s exclusive bi-monthly demonstrator magazine,Stampin’ Success. Benefits begin instantly with my on-line demonstrator sign up. Get exactly what you want and need to get started for only $99! With a completely customizable starter kit to work with, you can get started with the tools that are perfect for you! The Starter Kit ship FREE and you can customize it with your favorite stamps, inks and card stock. Click the link below to learn more about the starter kit. It is valued at around $190, so that is already over 50% off you goodies! When I joined Stampin’ Up! I was excited to see what was going to be coming out in the new catalog a month or more before the catalog was available to customers. I loved that sense of “being in the know” and plus I got 20% or more off everything I ordered, including preordering items before the catalog was launched! Once I was signed up, I realized there was even more to love about being a demonstrator than I realized. The bi-monthly Stampin’ Success magazine gave me tips, project ideas, monthly contests, and most of all, motivation. Then there was the many number of Stampin’ Up! demonstrator groups online that provided an immediate sense of friends and family no matter where I was. I saw demos turn to each other for ideas, support, prayers, and cheerleading. Finally, I realized how much I loved sharing this fabulous hobby with others and that I could make this a real business if I wanted to. I love that my business feels like hanging out with my friends and its way more fun than sitting at desk job!